If you like offense, you will want to check out Sunday afternoon’s Southern Methodist at Texas Tech game (3:30 p.m., ESPN). These are easily the two most pass-happy offenses in the nation. It’s also the debut of new Texas Tech coach Tommy Tuberville, who says he will keep some of former coach Mike Leach’s ‘Air Raid’ spread offense, but certainly will integrate more of a running game to get more balance. Last season, Tech ranked 115th in the nation in rushing (84.0 yards per game) and second in passing (386.8 ypg). New offensive coordinator Neal Brown plans to use more two-back sets and to turn Tech into a more physical offensive team. Meanwhile, Coach June Jones has resurrected the SMU program like he did at Hawaii. Last year the Mustangs were one of the nation’s biggest surprises in winning eight games, the program’s most since 1984. They also pulled one of the bowl shockers of 2009 in pummeling heavy favorite Nevada in the Hawaii Bowl. That’s pretty amazing considering SMU was 1-11 in 2008. TTU has won 13 games in a row in this series. The most recent was 43-7 in 2008. 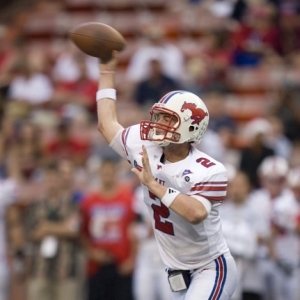 QB Kyle Padron led a late-season surge for SMU last year. Padron took over as starter when Bo Levi Mitchell was injured against Houston on Oct. 24 last year. Padron went 4-1 in the regular season and was named MVP of the bowl game, passing for a school record 460 yards and two TDs in the 45-10 win over Nevada. Overall he completed 135 of his 201 passing attempts (67.2 percent) for 1,922 yards, 10 touchdowns and just four interceptions. His passer rating of 159.92 was the fifth-highest in the nation. With top receiver Emmanuel Sanders having moved on, Padron’s top weapon will be WR Aldrick Robinson, who had 176 yards receiving in that bowl win. The team also has to replace RB Shawnbrey McNeal after he rushed for 1,188 yards and 12 TDs last year. Meanwhile, Taylor Potts won a close quarterback competition against Steven Sheffield in fall camp for Texas Tech. Last season in 10 starts Potts threw 3,340 yards, completing 309 of 470 passes for 22 touchdowns and 13 interceptions. But expect to see more of RBs Baron Batch and Eric Stephens this year after they combined for just 217 carries in 2009. SMU’s defense was a bit of a problem last year, ranking 84th in total defense but it did rank in the Top 25 in the country in forcing 28 takeaways. TTU is switching to an attacking 3-4 scheme under new coordinator James Willis, the former Alabama linebackers coach. The Red Raiders are 13.5-point favorites with an ‘over/under’ of 60.5. The side opened at 11.5 at most books and rose as high as 14. Approximately 70 percent of the lean is on TTU. The total was as high as 62.5 at some books. It’s still the highest total on the board in Week 1. If this were a few weeks into the regular season, I would definitely recommend the ‘over’. But since it’s the opener, you have to expect some rustiness – especially from a Texas Tech team with a new head coach and two new coordinators. Thus go with the ‘under’. I do like Texas Tech to win – it has won its past seven openers – but for SMU to cover as Jones no doubt has been reminding his players of the long losing streak in this series and the blowout lost just two years ago. Allen Eastman is back with his 99 System for NFL predictions in 2010 and before he even came across this system he was considered one of the best NFL handicappers making picks against NFL point spreads in the nation – now he is even better with this wining NFL betting system. Last season the 99 System was 27-13 ATS and this system not only helped his clients make a ton of money, but also helped Eastman to third place in the prestigious Las Vegas Hilton NFL Contest.